You are what you eat, and the same can be said for guinea pigs. With all the choices available in pet supply stores, it is difficult to determine what is acceptable food for your cavy. Providing a nutritious diet, including components from your own grocery store, will give her an ideal foundation for a long and healthy life. 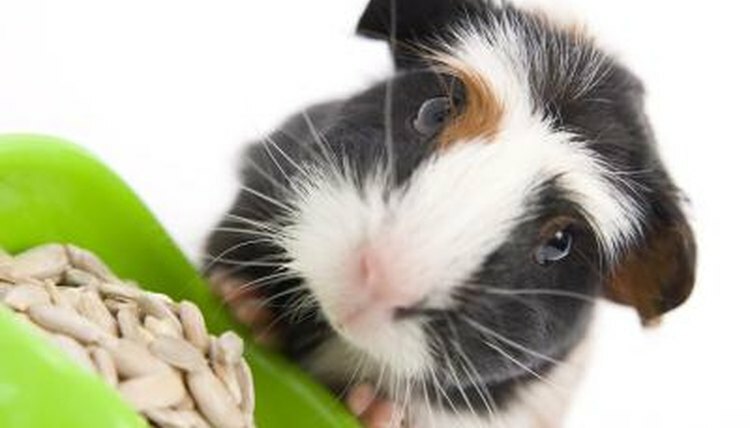 Nutritionally complete commercial pellets will make up the bulk of your guinea pig's diet. These are composed of plants, seeds and dried vegetables. Feed them to your cavy twice a day, in the morning and early evening, to prevent her from overeating and becoming obese. Grass hay, timothy hay or orchard grass aid in a guinea pig's digestive health. Hay also encourages gnawing, giving your guinea pig an alternative from chewing the bars of her cage. Give her plenty of hay to chew so that she never has to go without. However, do not give her alfalfa hay, which has higher amounts of calcium and can lead to health issues. As a guinea pig cannot produce vitamin C on her own, it is an essential component to her diet. You can offer manufactured tabs, though the cavy may not like the taste, and water drops are inefficient as they dissolve quickly, making it difficult to monitor how much your cavy actually consumes. Fresh fruits and vegetables are tasty ways to provide her with this necessary vitamin. A few orange slices is a perfect choice, but offer her variety as well to see what she prefers. Great sources of vitamin C include red and green peppers, strawberries, kiwi, broccoli, kale, dandelion greens, cauliflower and brussels sprouts. Feel free to try grapes, pears, corn, cucumbers, peas, carrots and romaine lettuce as well. Ideally, each guinea pig will eat a handful of vegetables and a large slice of fruit each day. Remove any uneaten food to prevent spoilage. Provide clean, fresh water and change it each day. Do not put it in a bowl, as a cat or dog would drink, as this can get dirty or spill over and soil the bedding. Your guinea pig will know how to drink it from an inverted water bottle. Similar to human diets, avoid feeding your guinea pig foods with too much sugar, carbohydrates and fats. This means no toasted oat cereals that are often used as treats for gerbils or hamsters. Do not feed her beans, breads, cookies, crackers, oats, potatoes or other human foods.